Morning Rundown: "We will rebuild Notre Dame in five years"
President Macron wants to rebuilt Notre Dame in five years — but experts have cautioned that this may not be possible. France and the rest of the world are still coming to terms with the devastation of the Notre Dame fire — but there are some significant domestic U.S. stories today too. While some have predicted it may take decades to rebuild Notre Dame to its former glory, President Emmanuel Macron wants it done in just five years. "We have so much to reconstruct. 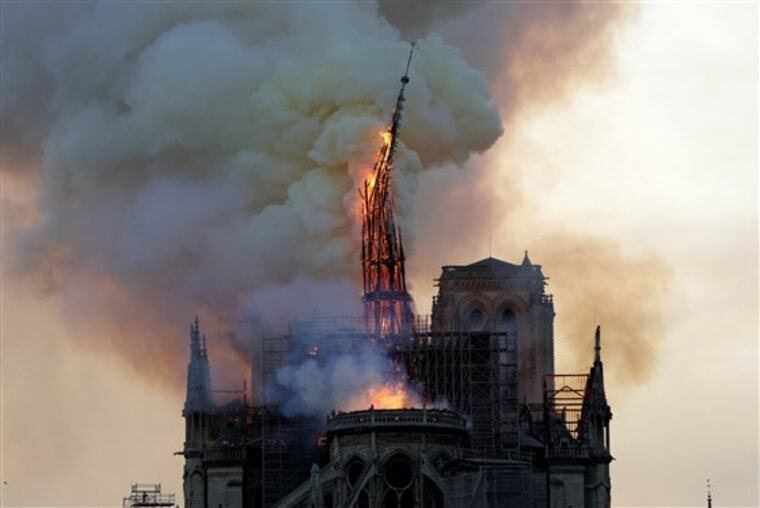 So yes, we will rebuild the Cathedral of Notre Dame more beautifully," he said Wednesday. "And I would like it to be achieved in five years from now." Video: President Macron: "We will rebuild Notre Dame"
Thousands of asylum seekers could spend longer in detention while a decision is made about their future, due to a ruling by Attorney General William Barr. Barr weighed in on an immigration case on Wednesday (see the judgment here) to establish that migrants facing full removal proceedings shouldn't be allowed to stay and live in the U.S. while out on bond. They can now be detained until there's a decision in their case — and some migrant rights advocates say that amounts to indefinite detention. However, one possible snag is that Immigration and Customs Enforcement doesn't have enough capacity to hold everyone: Barr said the rule should come into force in 90 days to give it enough time to build more beds. President Donald Trump used only his second veto on Wednesday to stop a bill to end U.S. involvement in the bitter and bloody civil war in Yemen. Earlier this month Congress decided to break with the president and invoke the War Powers Resolution for the first time to stop U.S assistance in a foreign war. But Trump is holding firm, saying the bill was an "unnecessary, dangerous attempt to weaken my constitutional authorities." Authorities in Colorado are searching for a woman said to be "infatuated with the Colombine shooting" and thought to be a "credible threat," leading to the closure of all metro area schools. A white man suspected of involvement in the burning of three African-American churches in Louisiana isfacing hate crime charges. Netflix has announced a record quarter for new subscribers, adding 9.6 million around the world to give it a total of almost 149 million. Tiger Woods' sporting comeback at the Masters was impressive — but it doesn't erase his past mistakes, argues Dan Solomon. Stonehenge might be the world's most famous neolithic structure, but who built it? A new study of skeleton DNA shows that people living in the area at the time were descended from travelers from Anatolia in modern-day Turkey. "It’s like seeing your own house burning. It’s just unbearable." Mike Laboda took his two girls to the ball game promising to buy them a puppy if Milwaukee Brewers outfielder Christian Yelich hit a home run in his third consecutive game. Of course, he hammered one — and Yelich himself delivered the dog after the game. If you have any comments — likes, dislikes — drop me an email at: patrick.smith@nbcuni@.com. If you would like to receive the Morning Rundown in your inbox Monday to Friday, please sign up here.